Has anyone stayed at Sparks Marina RV in Reno Nevada recently. What are your reviews? Good or Bad ? We stayed there about two years ago and there was A LOT of construction going on surrounding the park. Will be swinging by there in another month or so and will probably stay there again as it is such a nice park and a good location. Of course we were just passing through and it wasn't a destination. We stay there every year in September to see two grandkids in UNR. Very nice park, convenient to most everything in Reno & Sparks area. Thank you all for the input as to Sparks Marina RV Park. I have been staying at the Grand Sierra RV park on occasion when traveling thru Reno, but the darned airport is so close that it's hard to get any rest without a jet taking off every 2 minutes. It will be nice to try something different for a night or two on my way up to Lake Almanor. We are here right now for two nights. We've stayed here many times before as our niece lives in Reno. This park is very nice, the staff goes around in a golf cart and sweeps up debris and leaves, etc. All sites are astroturf but they have 3 pet areas and if you've a pet they will try and put you near one. Most sites are pull thrus and shorter ones are back-ins. They did have a back-in that fit us so we saved a few bucks. There is a car wash on Prater Ave which is about 200' from the rear wall of the park. It is a long park, so farther up front, there is NO noise. It can get a little noisy during the day if people use the automatic wash with the power dry, but it dies off toward evening. Other than that, the park is very quiet. The pool is under a resurface right now but I think it will be open soon. The spa is working, tho. We are coming back in mid-july for a weeks stay. Always call ahead as Reno/Sparks has several seasonal functions where this place can fill up. We lived there for three months last fall while working at Amazon in Fernley. I thought the RV Park was one of the nicest in the area and very close to shopping, the lake, walking path and the dog park on the lake. The restrooms and showers are the very cleanest I have ever seen in ANY RV Park from Alaska to Florida. The laundry facility is one of the first that we have actually used in any RV Park we have stayed at over the years. Most of the time we find a laundromat in the area because the RV Park machines are usually way to small for us and not too clean. Theirs is exceptional. They have a nice clubhouse, pool and hot tub. Richard and Barry, Thanks for your great reviews and information. Now I'm almost excited about staying there. The DW and I usually pass through Reno during May of each year on our way to Lake Almanor in Chester, CA. This is usually our spring getaway and after a little fight with the Big C this past year, I am really looking forward to a nice relaxing trip. 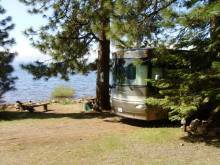 Below is a picture of our favorite campspot at Lake Almanor. Hoping to explore newer and better places soon.